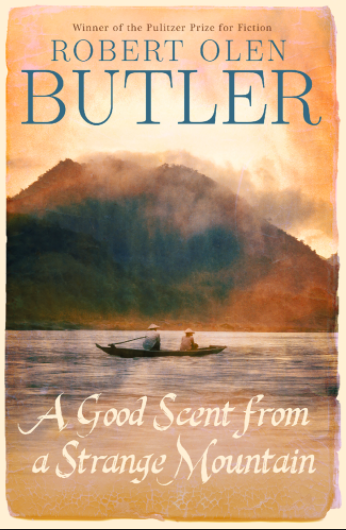 The minute I finished A Good Scent From a Strange Mountain, I looked to see if Robert Olen Butler's email address is listed online. It is. I haven't written to him yet, but when I do, it will be to tell him which of his stories made me cry, and why. Not because they are sad, I'll say, but because they feature endings so cutting, so poignant and powerful I am left in awe and gratitude for the experience of reading them. So thank you. Or maybe I'll chicken out and just hope he stumbles across this. A Good Scent is a collection of stories about Vietnamese immigrants who've resettled in Louisiana after the end of the Vietnam War (a location chosen for its similar climate). Cultural assimilation is of course a central theme of the collection but Butler delves much deeper, digging into the ways the social and cultural roots of America and Vietnam cross, and become entwined--or remain at odds. Loneliness. Nostalgia. Tribalism. Legacy. Huge concepts Butler injects effortlessly into short stories, peopled by the seemingly common. Only they're not that common. Not at all. They have outsized hearts, curious minds, and sorrowful souls. And you will love them. I definitely recommend this one. And if I were to write a long-form analysis of something from A Good Scent, the natural choice would be "The American Couple", which is a colorful and wholly absorbing portrait of middle-age marriage. Two marriages, actually, brought under examination when a pair of game show-winning wives bring their husbands on the prize trip to Puerto Vallarta. One couple is Vietnamese; the other, American. Both husbands served in the Vietnam War. This is what's good about America. There is always some improvisation, something new, and when things get strained, you don't fall back on tradition but you make up something new.